Today was the day of the funeral of my brother, Chris. Jackie drove Louisa and me to join family and friends at St Joseph’s Catholic Church, Wroughton, for the requiem mass; to the other side of Swindon for the cremation service, and back to Wroughton for the reception. Both the church and the crematorium were packed out with family and friends from his various walks of life. They came from all over the UK and from France, bringing together all the strands of his life. Such was their respect for him that his group, about to set off on a coaching holiday, began by attending the mass. Dylan Thomas, in perhaps his most famous poem, ‘Do not go gentle into that good night’, advised his father to ‘Rage, rage, against the dying of the light’. Chris, more at peace with himself than was the troubled poet, did ‘go gentle’, and was thus, as in so many other ways, an example to us all. The poem that I was honoured to be asked to read, reflected this, by advising mourners to ‘do what he would want: smile, open your eyes, love and go on’. 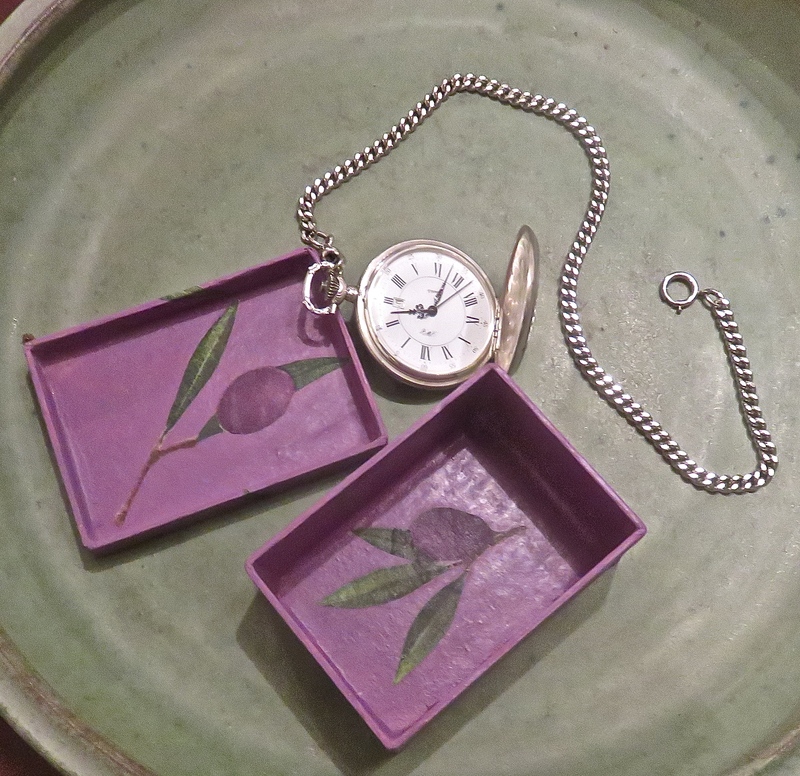 During the reception Frances presented me with a splendid fob watch, wrapped in a box she had made herself. This was his gift to me. 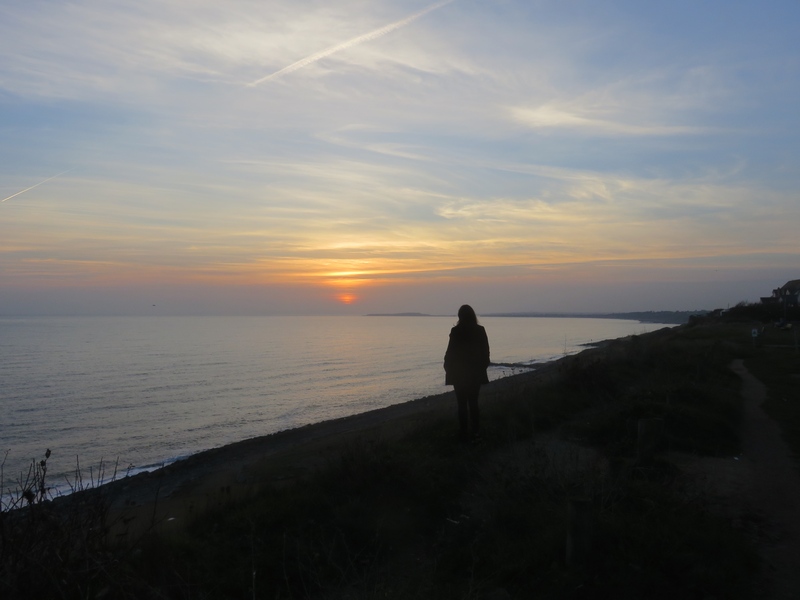 Arriving home towards the setting sun, it seemed appropriate to watch this phenomenon in silent thoughts from the clifftop at Barton on Sea. 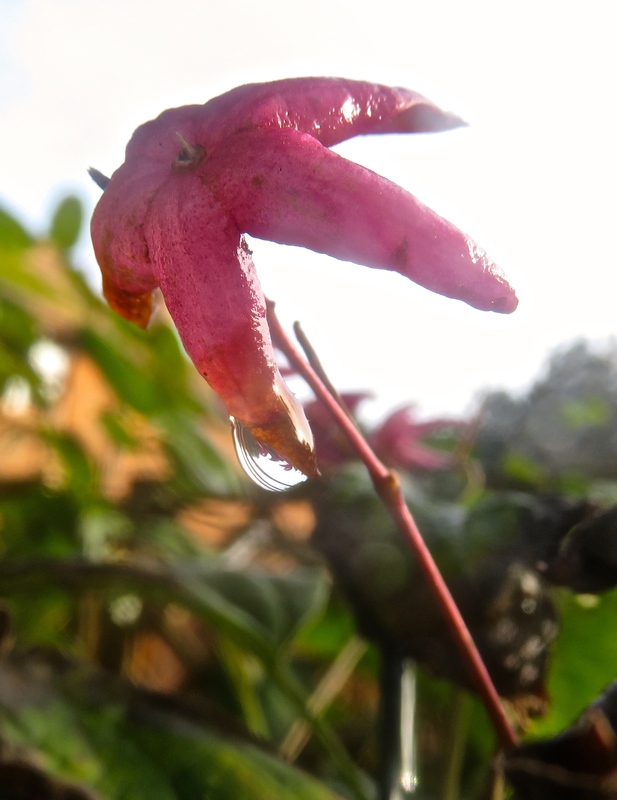 After yesterday’s constant rain, a bright morning lent a sparkle to everything in the garden. 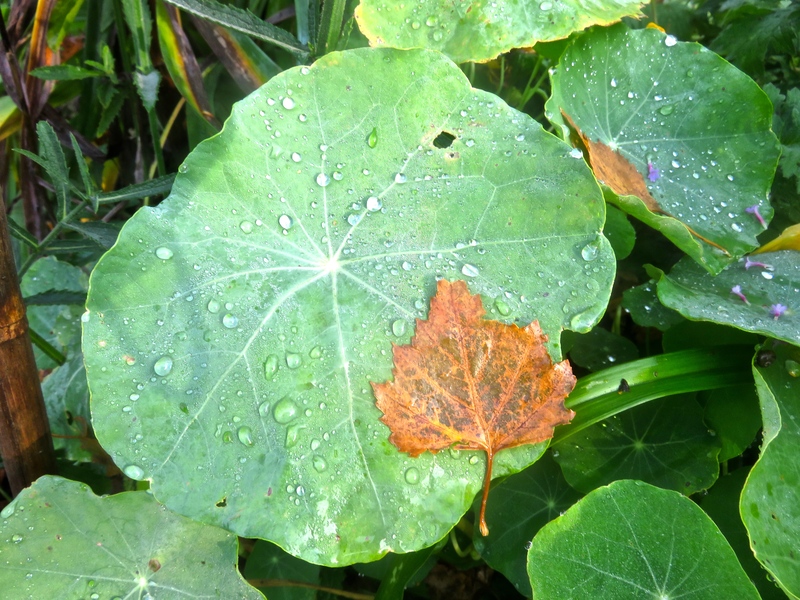 The Compassion rose was sprinkled with raindrops; as the broad nasturtium leaves that had halted the descent of those of the birch, and petals of verbena bonarensis. 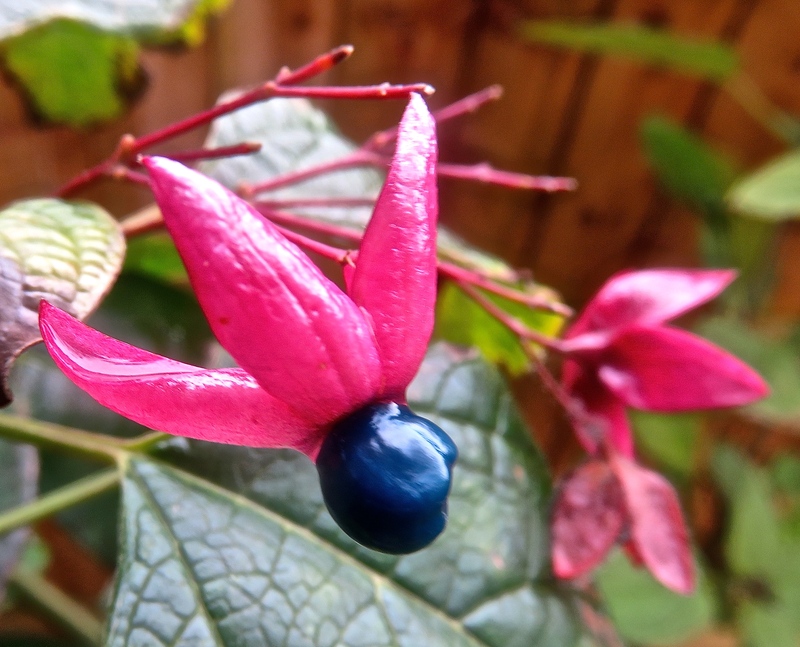 This clerodendrum trichotomum had the appearance of a parasol-shaped cocktail stick bearing a drop of Delboy’s pina colada, as featured in the long-running TV comedy series, ‘Only Fools And Horses’. It should have had a dark blue cherry fixed to the ferrule. 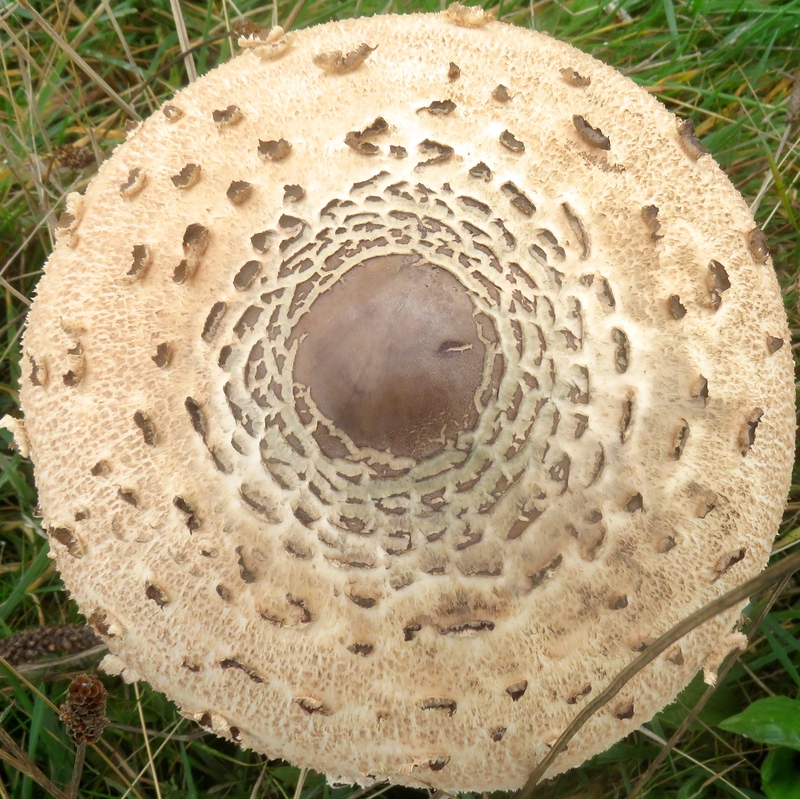 Perhaps that has been eaten. 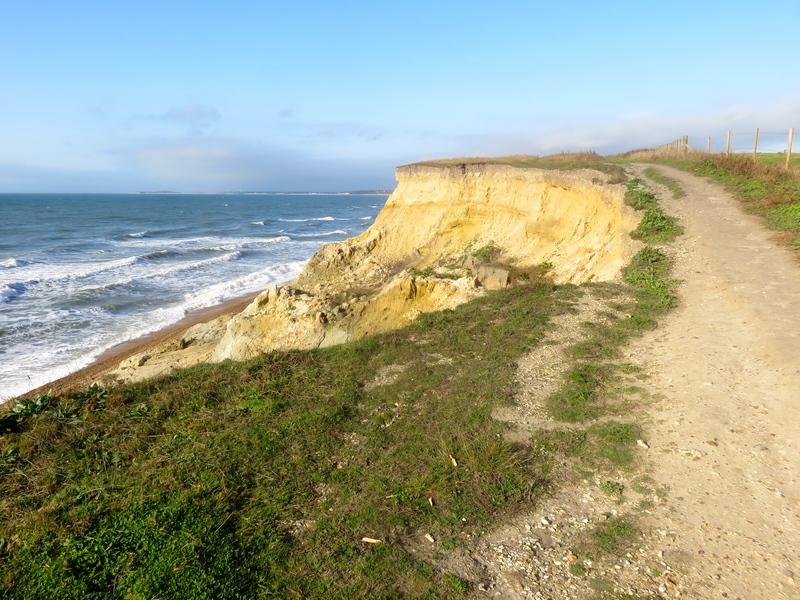 I took my usual Hordle Cliff beach walk. On this sultry summery morning, ringside seats on the shingle were filling up fast. 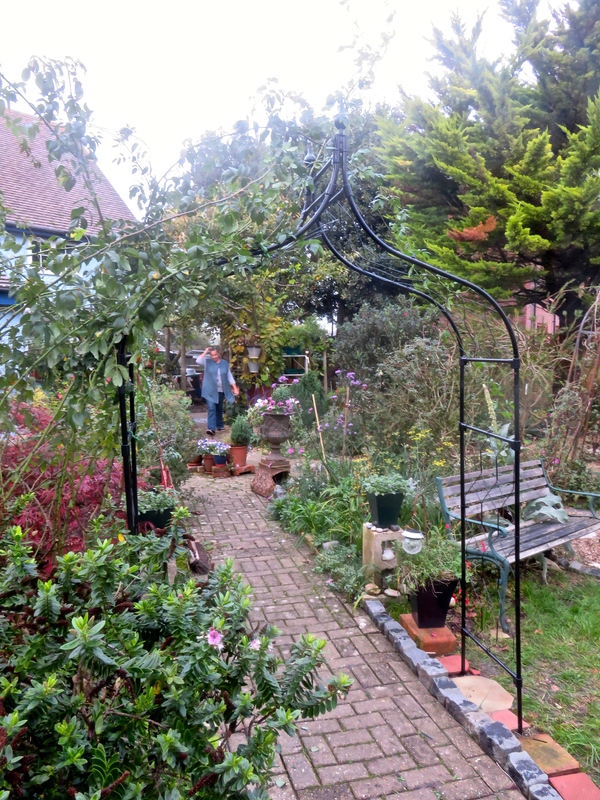 Soon after midday we took delivery of an Agriframes Classic Gothic Arch, and set about assembling it and putting it in place. 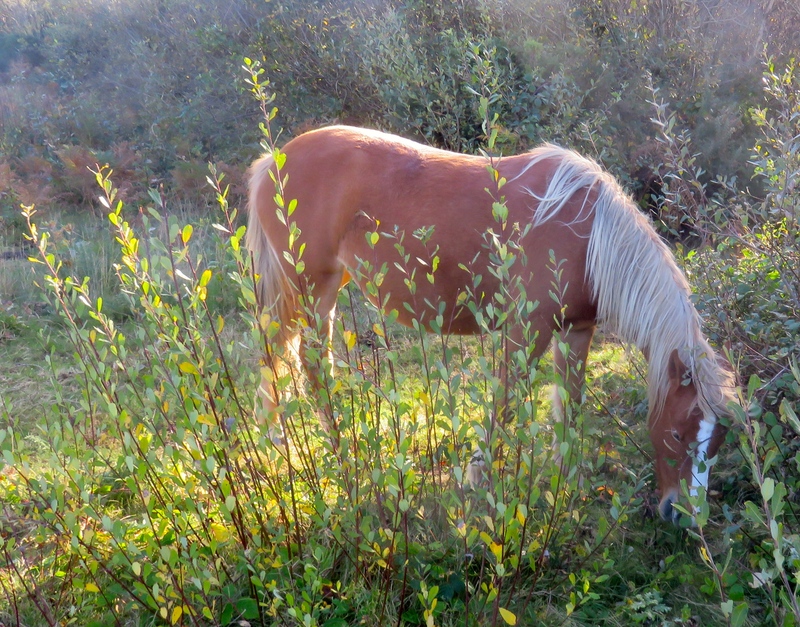 This was to occupy us until the light faded as the sun began to settle itself down for the night. 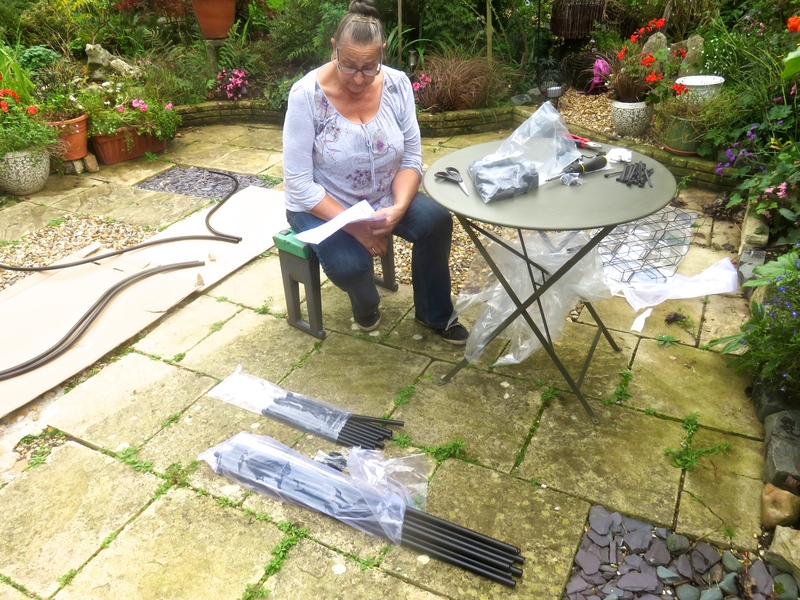 Even Jackie was flummoxed by the totally inadequate instructions that were enclosed. She needed my input to help decipher them, which, as my regular readers will know, is really saying something. A favourite of the R.H.S. gardens at Wisley, this elegant structure comes with a fifteen year guarantee. This is quite crafty really because it could take several of those years, before it is exposed to the elements, to construct it. At the midway stage, we were advised to fix the bottom poles into the ground. A hole-maker was provided for the purpose. This metal pole was easily driven into the soil on one side of the path the arch was to straddle. On the other side, a few inches down, I struck an immovable object. Stone? Concrete? I wasn’t about to find out. We moved the site until all four holes could be pierced to the required depth. From then on it was comparatively plain sailing. Until we found we had two screws left over. A minor panic ensued as we carefully checked each spacer bar. There were none missing, so we decided someone on the assembly line must have been feeling generous. 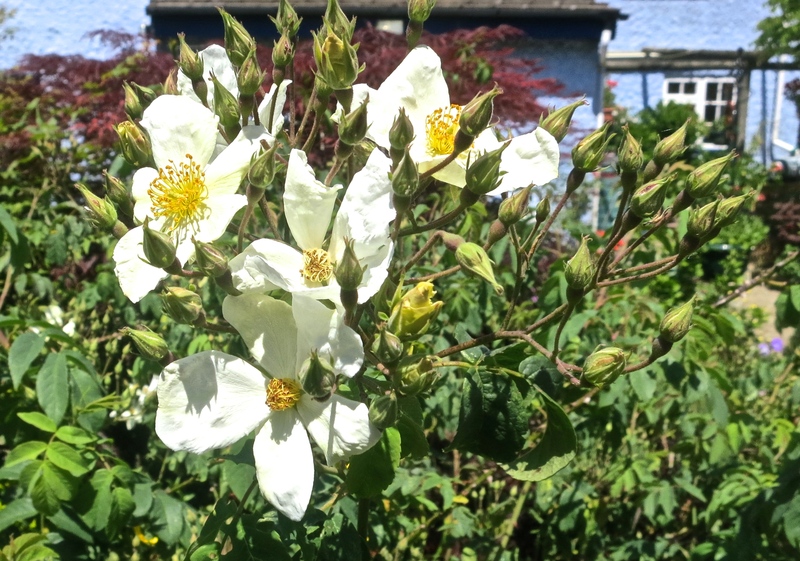 The need for the arch was occasioned by a beautiful mature white rambling rose that was, during the summer, running rampant over the surrounding shrubs. Jackie had pruned it heavily earlier in the year as it was becoming a danger to passers by. 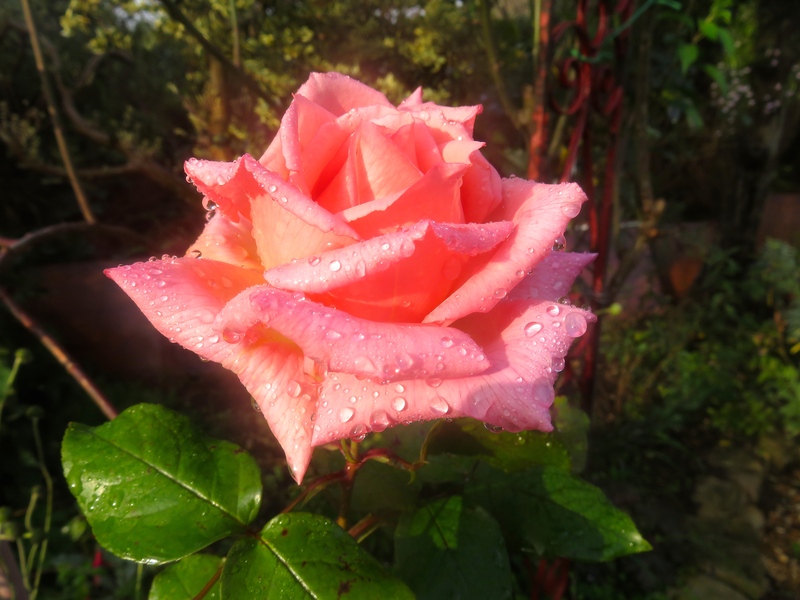 Once we had erected the arch we trained much of the rest of the rose onto it. There is still tidying up to be done, but we had had enough for one day. This evening Jackie will drive us to New Milton to collect Louisa who will stay overnight and leave with us early in the morning for Chris’s funeral. We will all be early to bed with Jackie’s lamb Jalfrezi inside us. 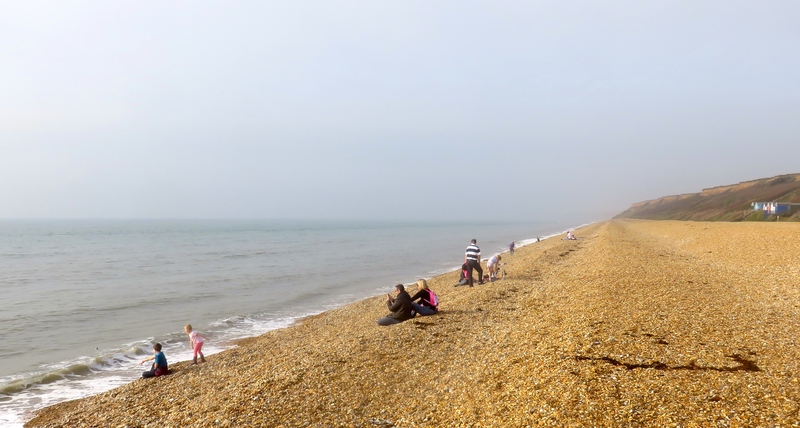 As I walked down Downton Lane on my usual Hordle Cliff walk this morning, the fog alert signalled that there would be nothing to see across The Solent through the grey skies and driving rain. 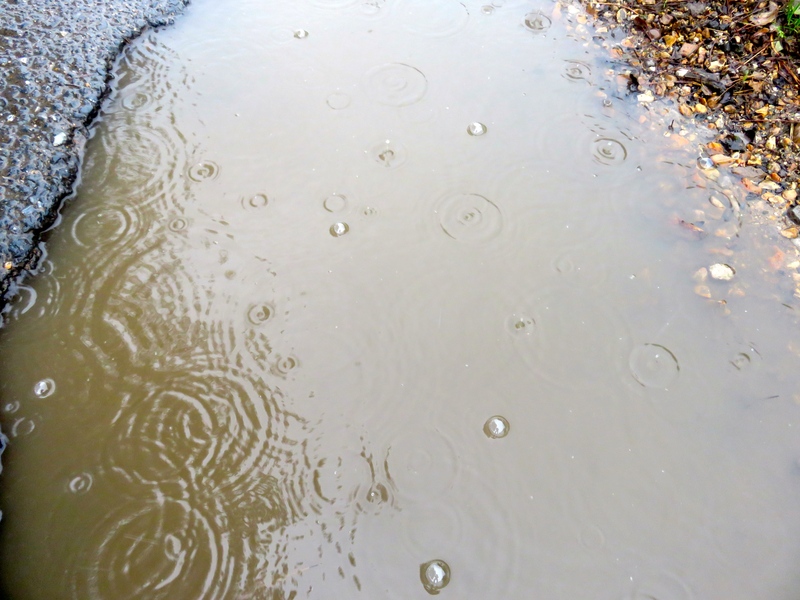 Bubbles forming and floating on the roadside pools slowly burst and created concentric circles on the surface which was thrown up by passing cars. A speckled snail hauled its humbug home up a soggy stem. 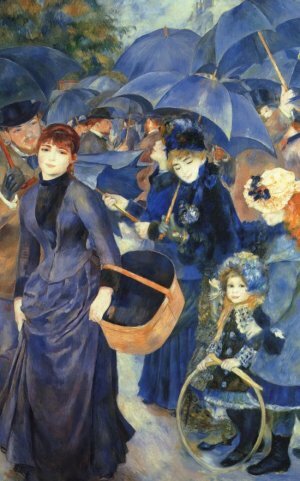 Reminding me of Renoir’s famous painting ‘Les Parapluies’, an optimistic family sheltered under umbrellas as they made their way to the beach from Shorefield. 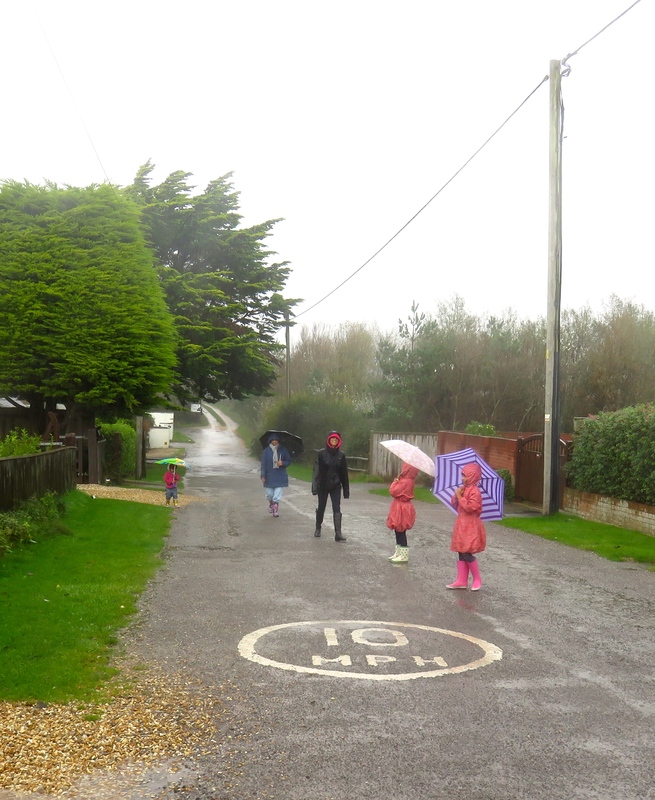 The children needed a walk. 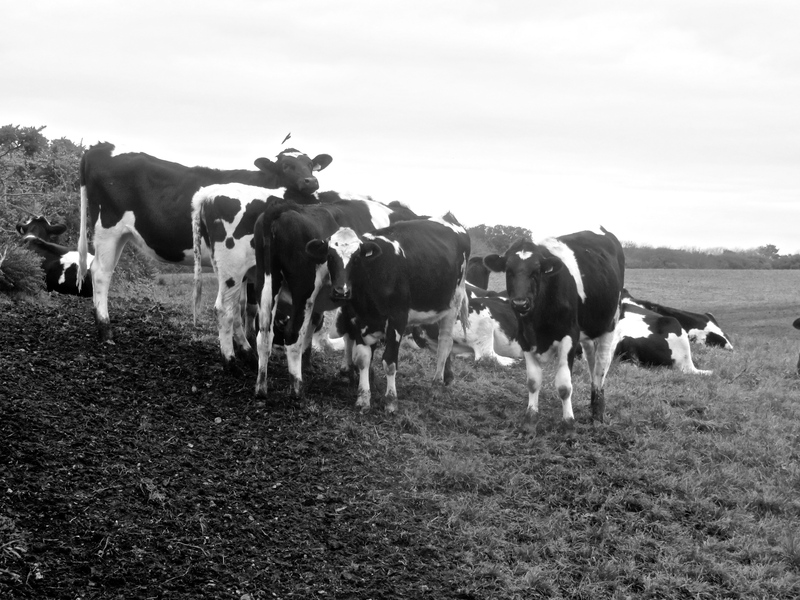 The straggler was quite interested in being photographed. Today’s Royal Mail post brought an invitation from BT to discuss cheaper options for our contract. Naturally I phoned them. A delightful young woman soon came on the line and renegotiated our account. We will now have a slightly smaller bill for faster Broadband and unlimited weekend calls. The contract has been transferred to my name, which rather pleased Jackie. We will need a new home hub which I am assured I will be able to install. Sixteen young commissioners, aged 10 to 19, from the Children’s Commission on Poverty have recently produced research findings suggesting that the need for parents to provide certain extras, like computers, are pricing some families out of educational opportunities. At Wimbledon College in the 1950s there were no PCs to be acquired. Most of the extras in those days were for additional activities such as the Boxing Club. The school was not really geared for art, so it was an unusual, if not the first, request for me to sit the ‘O’ Level examination in 1958, and no books were available. 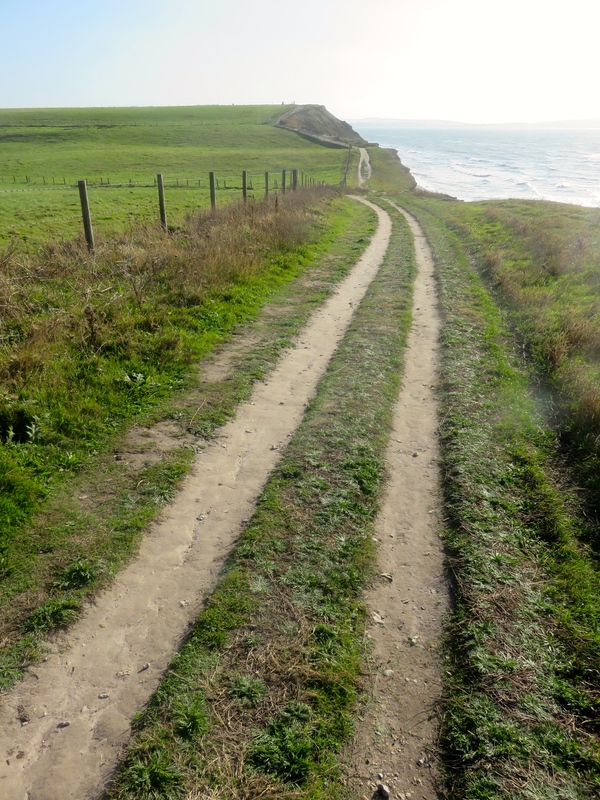 Although I don’t remember, Matthew Hutchinson, who would have walked it, must have sat it too. 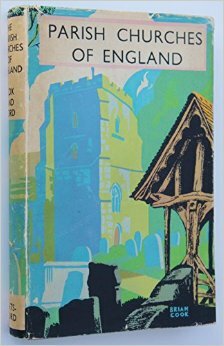 The examination was largely an assessment of your artwork, but there was one set book, ‘The Parish Churches of England’, by John Charles Cox and Charles Bradley Ford. The school failed to supply this essential volume, and my parents could not afford it. Mum ordered it from Wimbledon Library. As the weeks rolled by, we waited with bated breath for its arrival. It was in our hands after school the day before the exam. Using a twenty four hour clock this would have been the sixteenth hour, but it certainly felt like the eleventh. Having the advantage of reducing the text a little, this small format architectural history of our traditional places of worship was lavishly illustrated with black and white photographs. It had to be read in order to answer exam questions that would face me the next day. There would be possibly four illustrations from the book which I would need to identify and to comment upon. I skim-read the pages of the book. I stared at what seems like hundreds of pictures. I couldn’t memorise them all. I selected some I thought most likely examples of various periods or styles of architecture. It was rather late by then. I was pretty tired from the reading, and Mum had completed her normal heavy duty day of caring for the family. Our adrenalin, however, kicked in. That was the answer. A mnemonic is a device dreamed up to aid memory retention. There are various types of these, one of which is rhymes, an example of which is ‘Thirty days hath September, April, June, and November………’, enabling us to remember how many days there are in each month. Fixing my eyes in turn on each of the images I thought most likely to turn up on my desk the next day, I recited an invented nonsense rhyme until it was burned in my brain. Mum then took the book in hand, and, opening the tagged pages at random, asked a question about the photos thereon. By running the relevant rhyme through my head I came up with an answer. At first these were not always correct. A certain amount of repetition, late into the night, was required. Finally, reasonably satisfied, we repaired to our respective beds. I had chosen well. I recognised each of the illustrations in the exam and answered the questions to the satisfaction of the examiners. Phew! For this evening’s dinner Jackie produced a tender beef and mushroom casserole with Boiled potatoes, cabbage, cauliflower and Brussels sprouts. Profiteroles were to follow. I drank Castillo san Lorenzo reserva rioja 2009, and Jackie didn’t. Yesterday evening, after dinner, Jackie attempted to turn off the extractor fan. She pulled the cord. Something snapped inside. To reach it I had to climb up on a chair. Fortunately the glass spice jar I knocked off the top of a tower of shelves didn’t break. I fiddled around and found a screw under a cap. 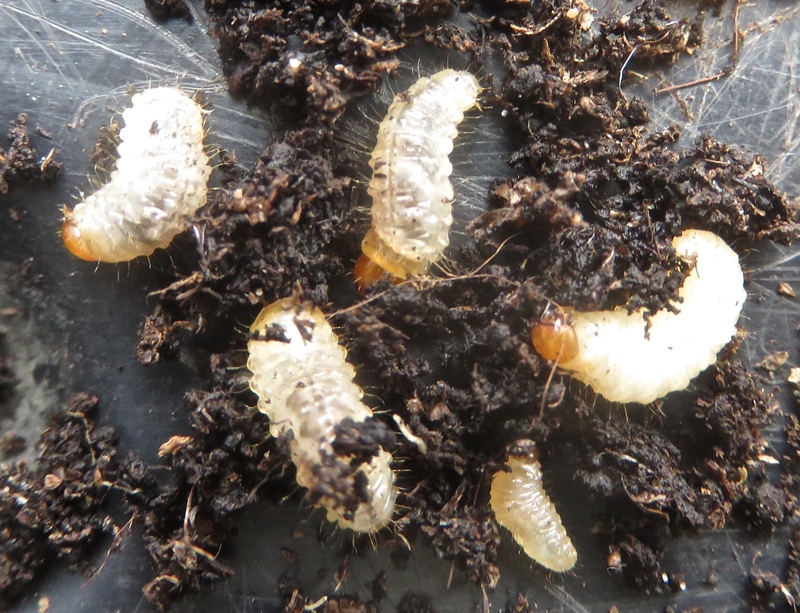 I unscrewed it and removed the casing, to discover a small piece of plastic had sheered and come adrift. This meant I had to release the mechanism manually. At least I stopped the fan, but until we buy and fit another, that is how it will need to be turned on. This morning, Joe, The Lady Plumber’s ‘lad’ came to remove the now redundant piping from our bathroom. Before that we had bought the fireworks for Saturday from Lidl, posted the redundant TV box to BT, and took in two jackets for cleaning. I then cleared ten brick lengths of bramble and ivy roots from the back drive. Jackie was out to lunch with her sisters, but sensible enough to have left me a beef and mustard sandwich garnished with tomatoes. 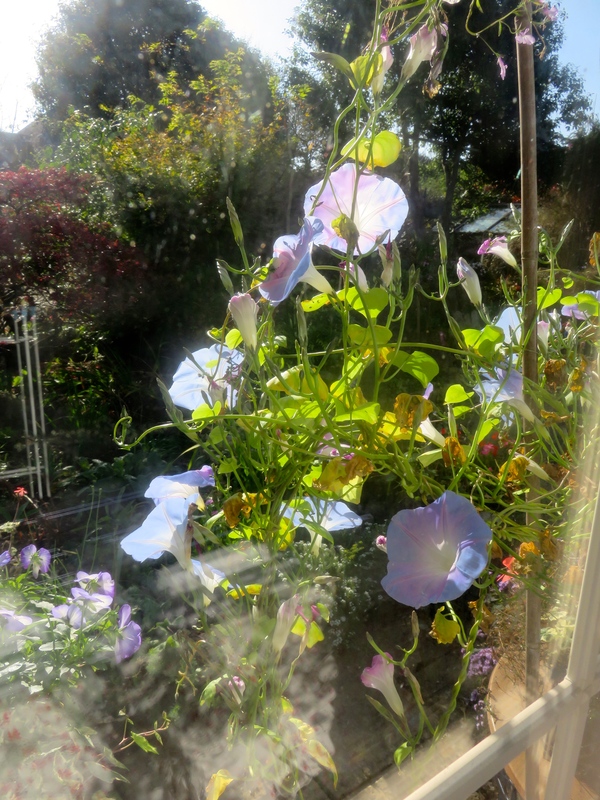 Whilst I enjoyed it I also got pleasure from the cluster of sunlit pale blue morning glories shot with pastel pink that can be seen through the kitchen window. 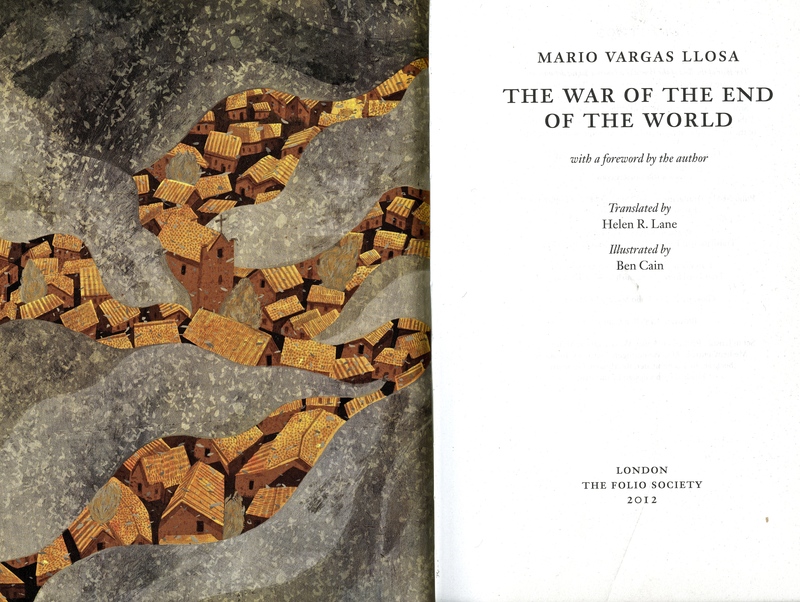 This afternoon I finished reading Mario Vargas Llosa’s haunting historical novel: ‘The War of The End of The World’. A Peruvian, the author chose to set his book in Bahia, a North-Eastern state of Brazil, as the nineteenth century was coming to a close. The book was originally published in 1981. My 2012 Folio Society edition uses the 1984 translation by Helen R. Lane. Ben Cain’s illustrations reflect the primitive nature of the story. A very lengthy tome, it was only the political sections that I had difficulty following, and sometimes found rather boring. We are sensitively shown how the extreme poverty of underprivileged, landless, disabled, and uneducated people of that time and place affected their wretched lives, enough for them to flock to the shelter of a community established by a mystic preacher. Each character is beautifully and touchingly described as the civil War of Canudos progresses to its bitter end. The harshness of the terrain and climate adds to the horrors of thirst, starvation, wounding and destruction, which beset both the settlers and the soldiers sent to drive them out. Transcending all this is the superhuman emotional and physical strength displayed by people ultimately barely alive. The prose, having set the scene at a more leisurely pace, builds naturally, briskly, to a final crescendo. I have to say I was confused by the alternation between present and past in various sections. This was clearly not the fault of the translator, who seems to have done a remarkable job. Ultimately the state cannot tolerate this enclave hoping to live in peace apart. The title of the book reflects the belief that the world would end at the turn of the next millennium, a myth which perhaps Vargas Llosa is dispelling. Not knowing much about South American history, this novel had me researching the conflict that took place during 1896 and ’97. I learned that Antônio Vicente Mendes Maciel, an itinerant preacher who had been wandering the less inhabited areas of Brazil for the previous twenty years and had taken the name Antonio Conselheiro (The Counsellor), set up the community in question in 1893. Bahia was then a desperately poor zone, with a disenfranchised population living on subsistence agriculture. As such it was ripe for his influence, seeking hope from his promise of a better world. 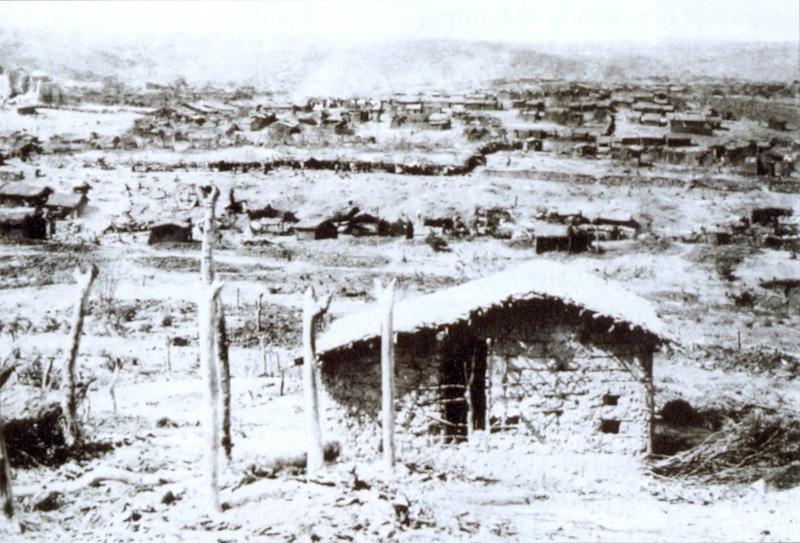 After a number of unsuccessful attempts at military suppression, a large Brazilian army force overran the village and killed nearly all the inhabitants. Daniel’s fish and chip restaurant provided our dinner this evening. My beverage was tea; Jackie’s was coffee. 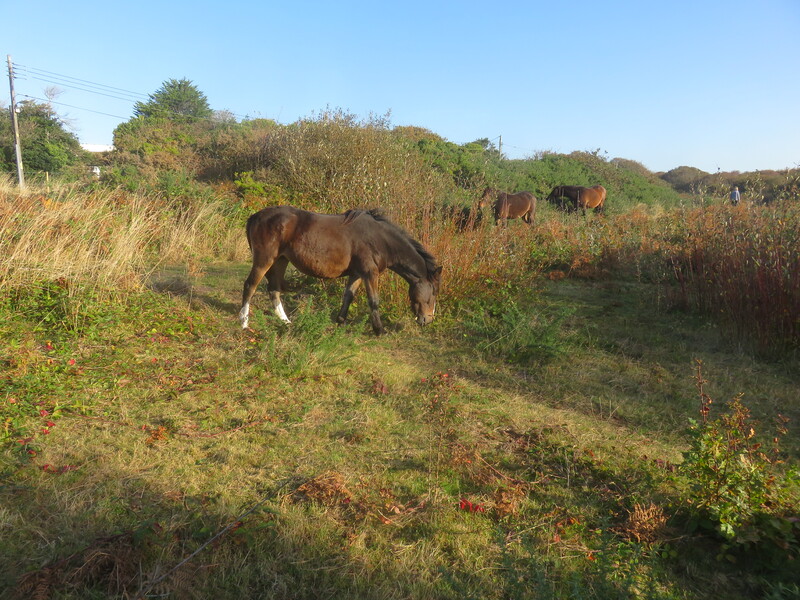 What I had stumbled upon three days ago was the edge of Barton Common, into which, Jackie had read, had been reintroduced New Forest ponies in order that, by their chomping and defecating, they could return the area to its natural habitat. As it was indeed a day of enticing light, Jackie drove me there this morning. 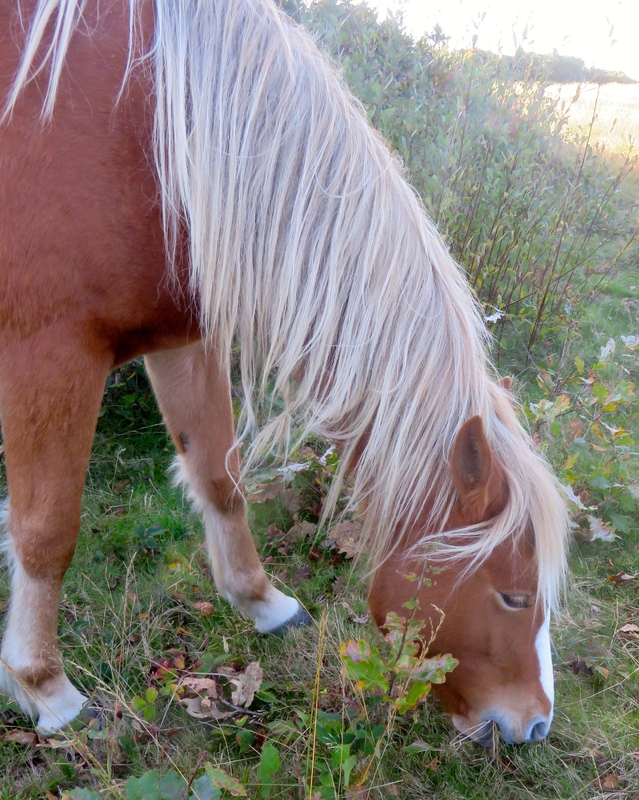 I wandered around the common, and found the six very well fed ponies. As I crouched down to take its companion’s portrait, another crept up behind me and disconcertingly breathed down my neck. 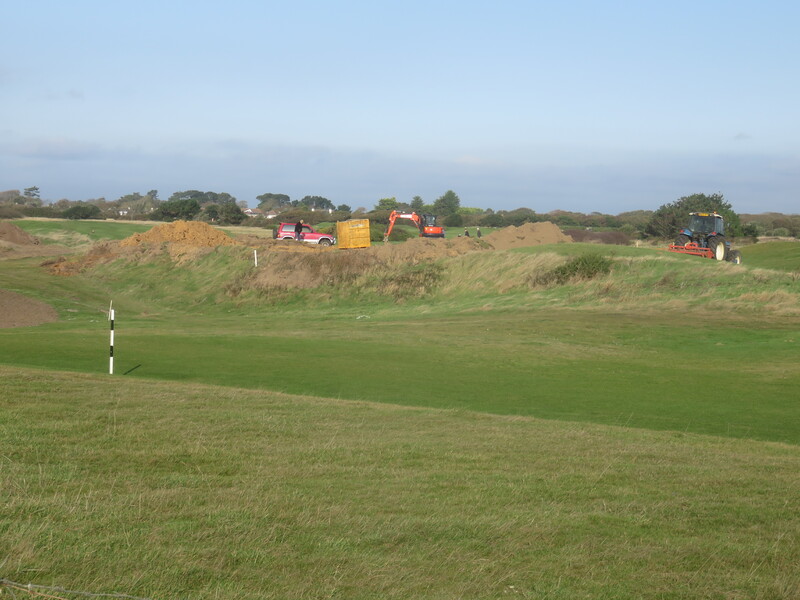 I then walked through the golf course that was still undergoing maintenance, and back along the cliff top to West Road and home through Shorefield. 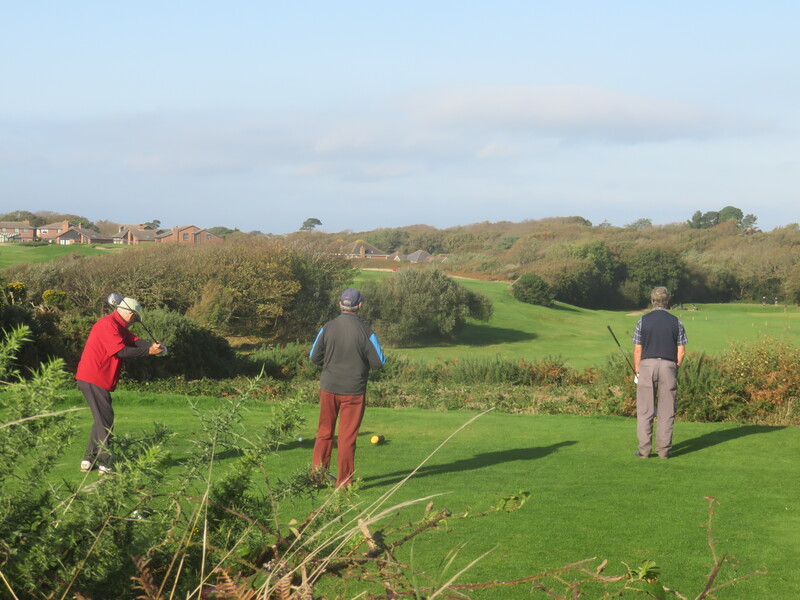 Golfers were out in force. 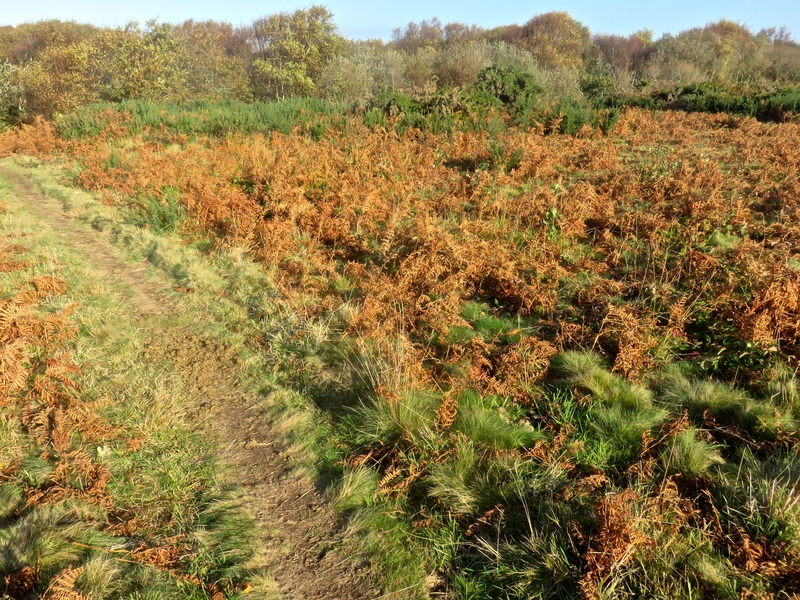 A trio of the sportsmen, silhouetted against the skyline, gesticulated and indicated that I had strayed from the public footpath. 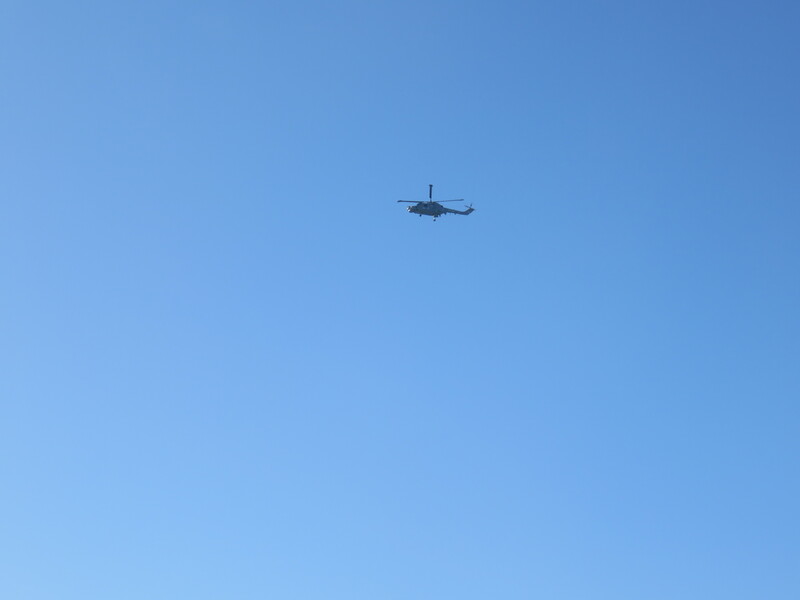 Once I got the message, I called to them and, waving my camera, asked for a repeat performance. One gentleman obliged. I can only assume he was being polite. 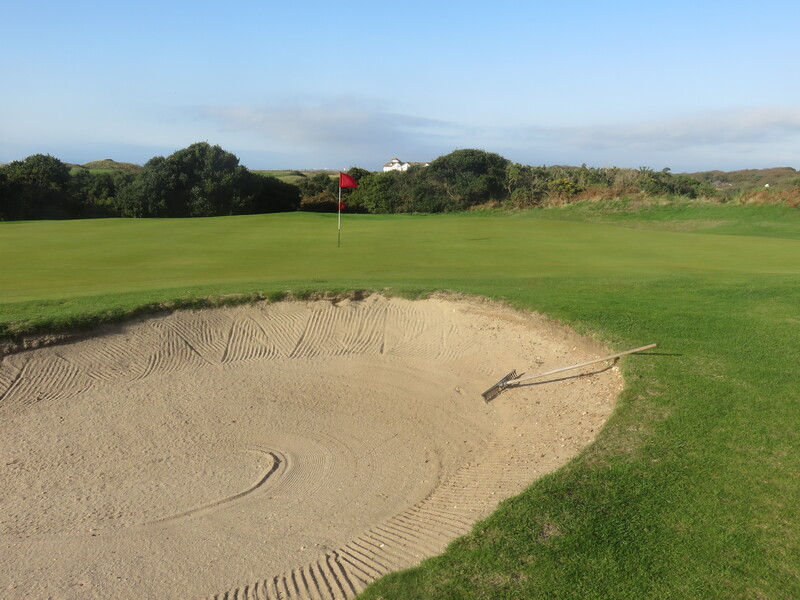 The patterns on a neatly raked bunker had yet to be disturbed. 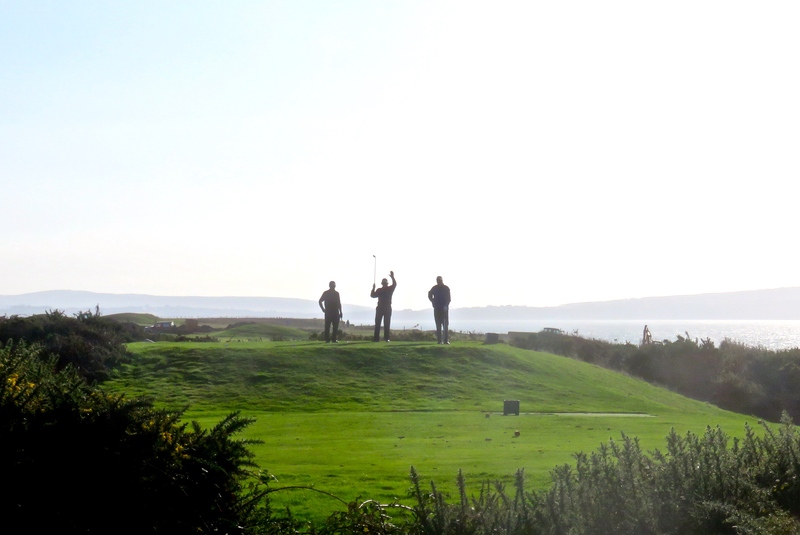 A helicopter, its propeller blades whirling overhead, was probably safe from sliced golf shots. 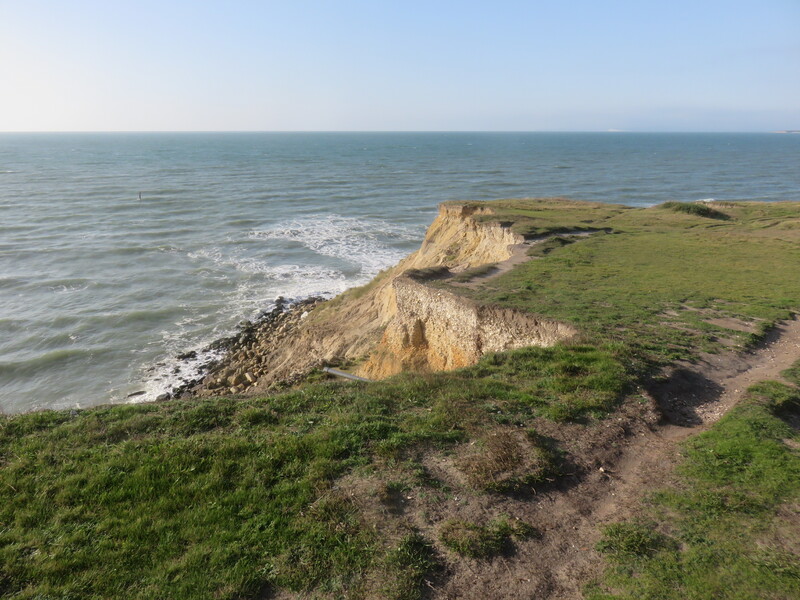 From the golf course I could see a family walking along the cliff path which, keeping as far away as possible from the edge, I soon joined. 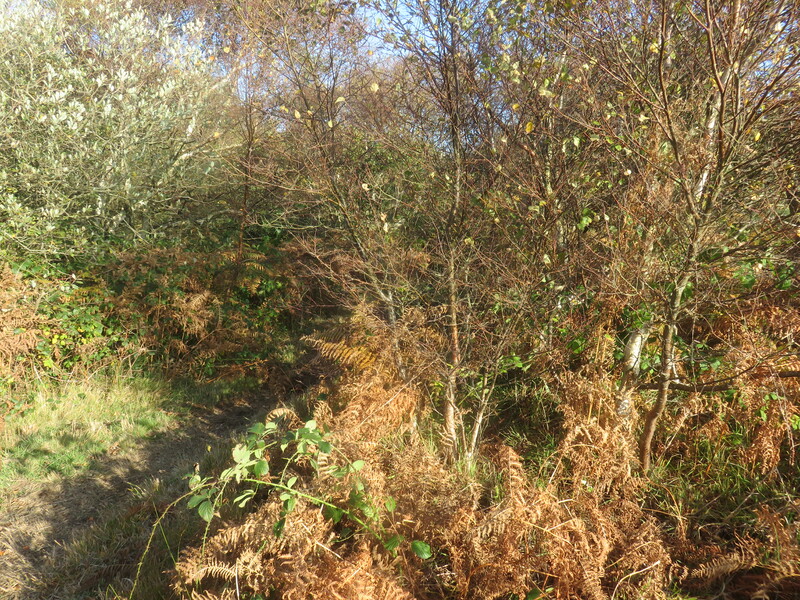 At one point I preferred a scramble between brambles and barbed wire to the precarious looking path. An approaching gentleman, made of sterner stuff, stuck to the footpath. When I told him he had more nerve than I have, he replied: “Stupid, probably’. While I was uploading these photographs Barrie dropped in to present me with a signed copy of his latest publication ‘Lawnmower maintenance and other pastimes for the elderly’. I shall enjoy reading it. 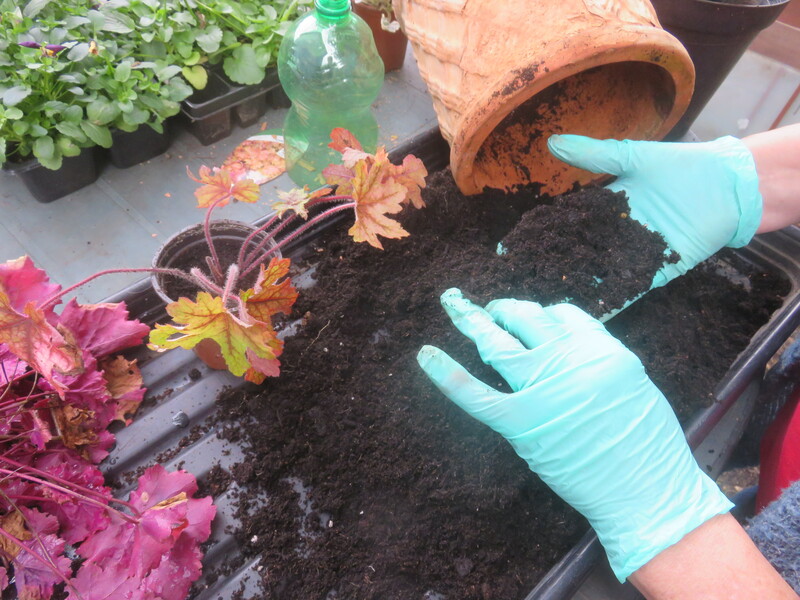 This afternoon I continued digging up bramble and ivy roots from the North side of the back drive. Now I have reached inside the gate, I am measuring my slow progress by the lengths of the bricks in the border that we have been unearthing as we go along. Today’s total was eight. I’ll probably need an abacus by the time I have finished. Our dinner this evening consisted of tender beef casserole, mashed potato, carrots, cabbage, cauliflower and broccoli, followed by lemon drizzle cake and evap. Jackie drank Hoegaarden and I finished the rioja. 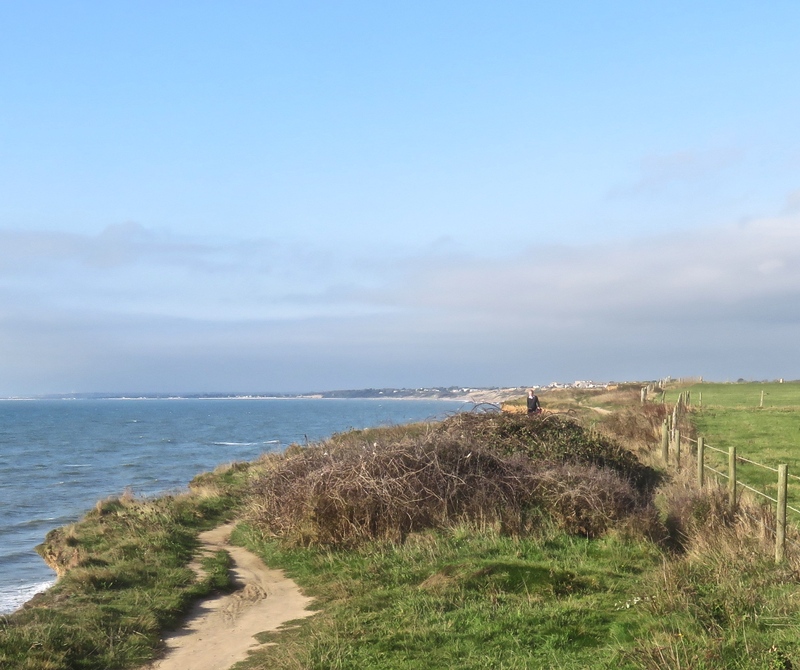 I walked my normal route to Milford on Sea and back this morning. 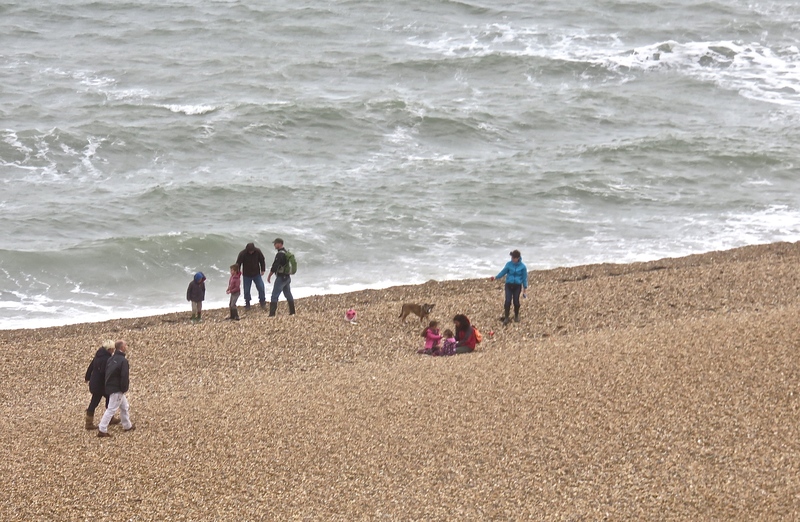 Waves buffeting the beach were choppy and the wind blustery, but that did not deter families settling on the shingle, along which couples perambulated. 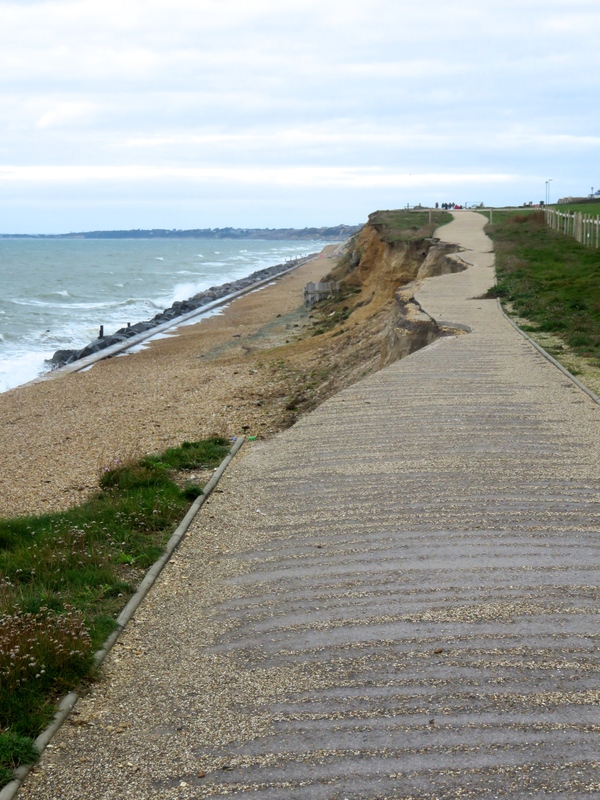 Part of the footpath that I had, only two days ago, described as safe, has tumbled down the cliff and been bordered by a protective fence. 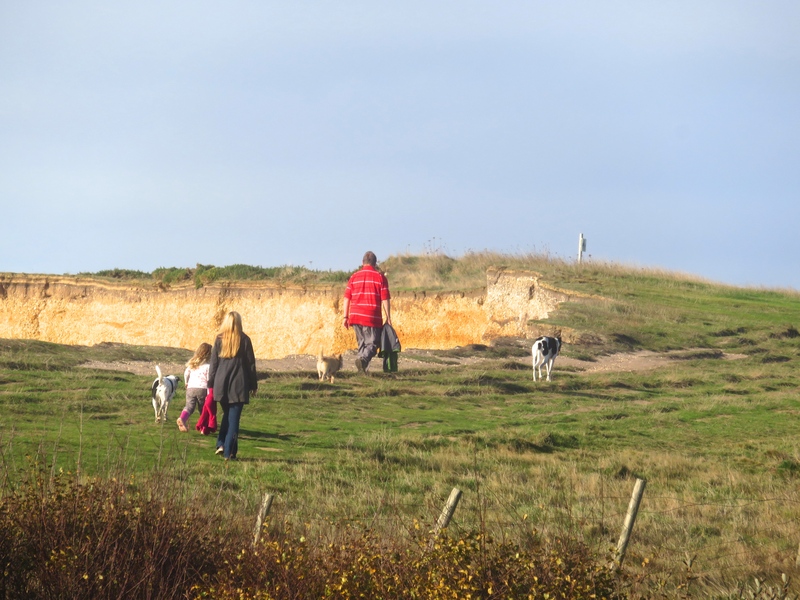 On the cliff top I met a man walking his dog, who was amused at himself for having forgotten to put his clocks back last night, the end of British Summer Time. He was impressed by how many jobs he had managed to do after having risen so early, but he thought the day ahead would be a long one. 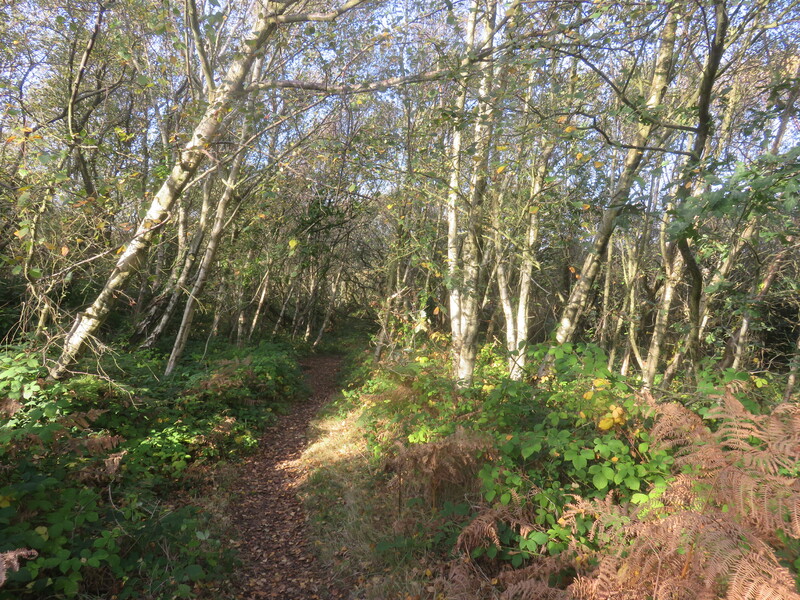 In the Nature Reserve an elderly gentleman tipped his hat to me as we exchanged greetings. 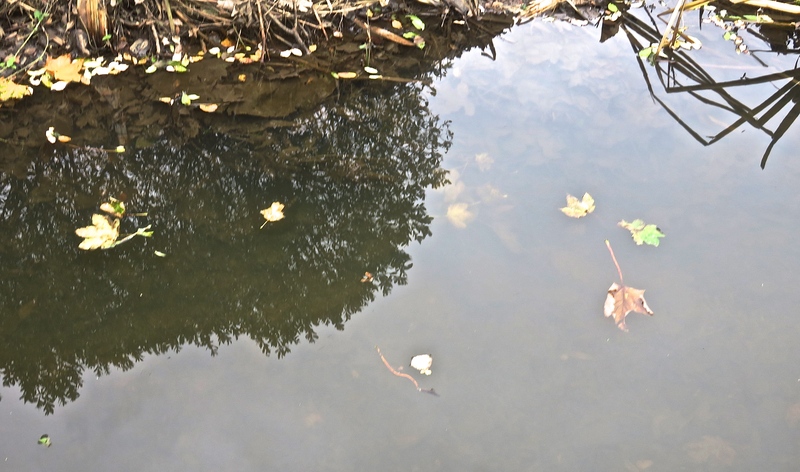 Watching fallen leaves sailing sedately on the surface of the stream, I was reminded of Flora Thompson’s book. My copy of this classic portrait of a nineteenth century Oxfordshire village is illustrated by Lynton Lamb. 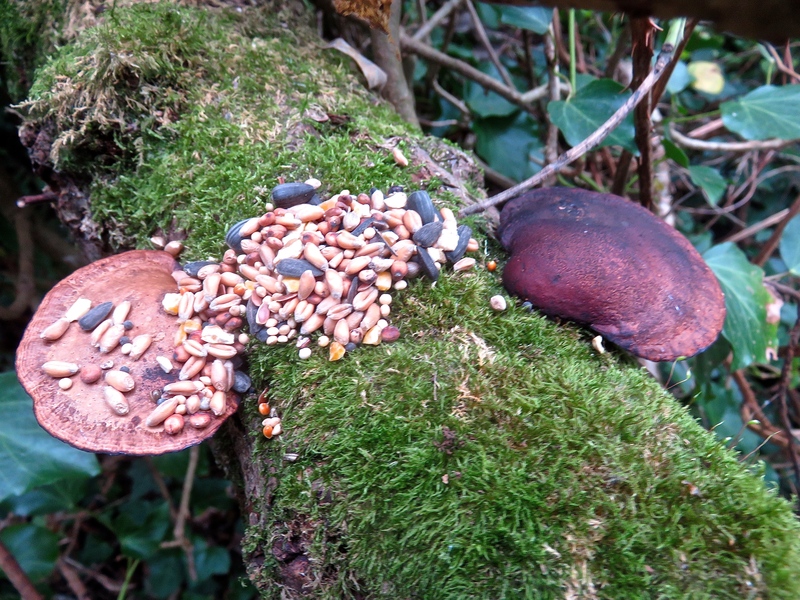 At intervals along the trail, birdseed had been heaped upon tree fungus. Perhaps Hansel had been returning the favour of the white feathers. 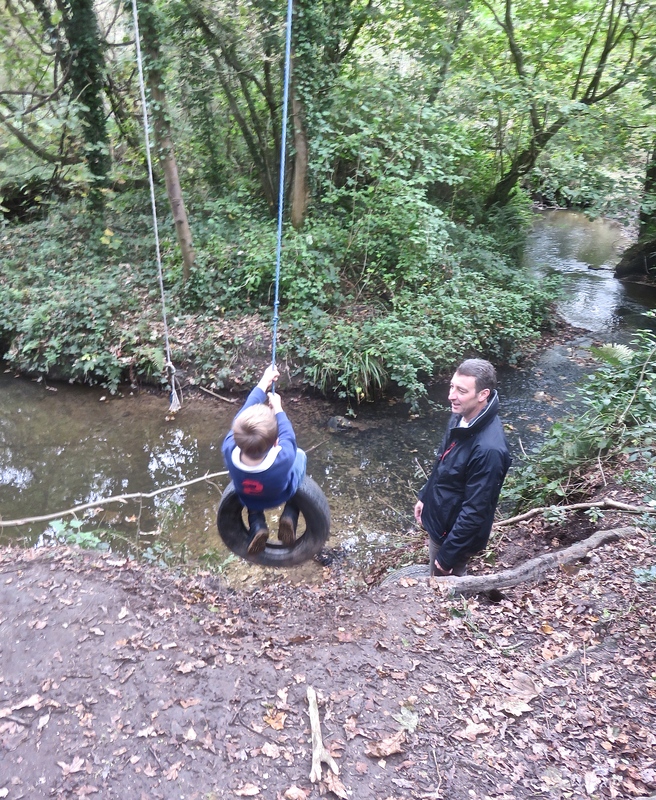 To a certain amount of trepidation by his mother, a small boy was having great fun on the swing I had noticed previously. She had not, fortunately, seen the first episode of ‘Grantchester’, in which a snapped rope bearing a similar swing gives James Norton, playing a charismatic Cambridgeshire village clergyman, an opportunity to emulate Colin Firth’s wet shirt scene in ‘Pride and Prejudice’. Based on the detective novels of James Runcie, ‘Grantchester’ is now a major ITV television series. Norton’s Sidney Chambers develops an unofficial partnership with Robson Green’s Geordie police sergeant. 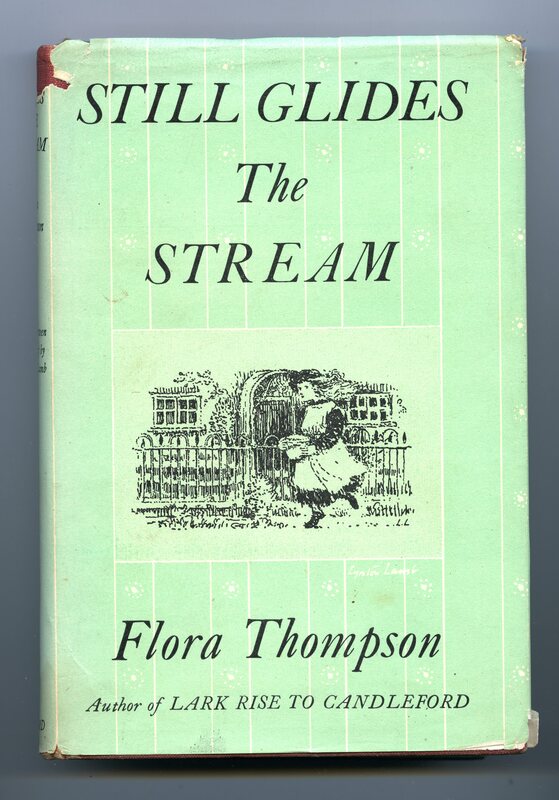 Flora Thompson’s story was published in 1948, and the detective series is set in the 1950s, so they are contemporaneous in period, if not in authorship. Later, we watched the second episode of Grantchester. Well, we had to, didn’t we? Although we ate it in the evening, Jackie produced a superb traditional Sunday lunch. Slow roasted beef was accompanied by roast potatoes, parsnips, and Yorkshire pudding; thick gravy jam-packed with juices from the meat; brussels sprouts, carrots, cauliflower, and broccoli. After this we could just manage a custard tart. Jackie drank Hoegaarden, and I drank Castillo San Lorenzo reserva 2008 rioja. 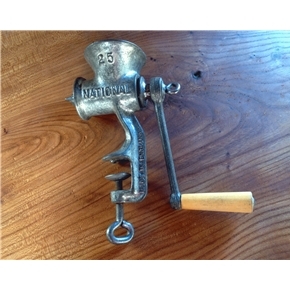 As is often the case when enjoying such a meal, we spoke of our mothers’ roast dinners of our childhoods in the ’40s and ’50s, which we converted to cottage pies on Mondays with the aid of a National or a Spong hand-operated mincer that was clipped to a tabletop. You put the pieces of left-over joint into the bowl at the top, turned the handle, and the minced meat was forced through a circular grill, and dropped out of the spout into a waiting container. Jackie, herself, used one when we were first married in 1968. 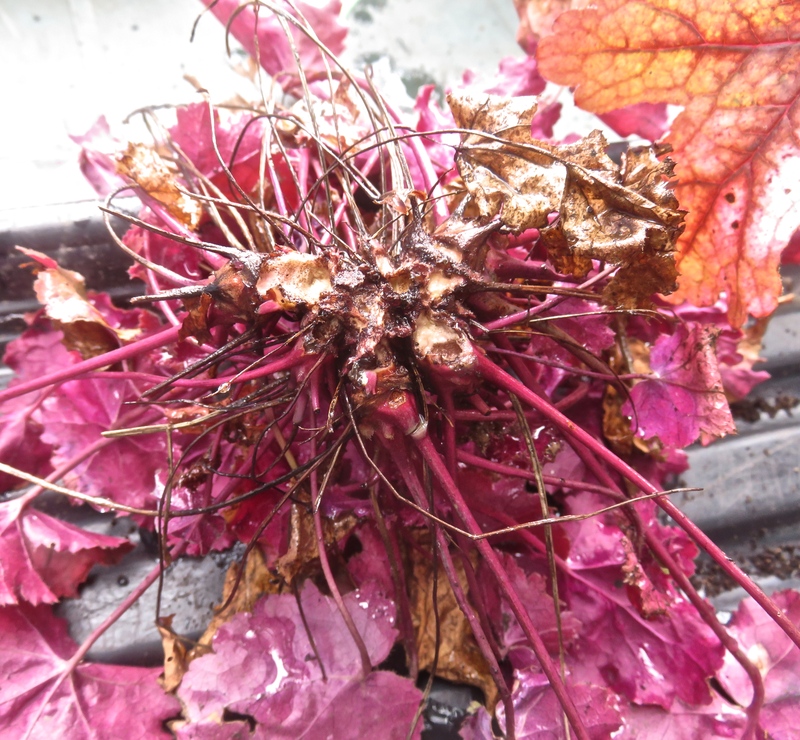 Vine weevil larvae have been feeding on the roots of Jackie’s prized heucheras. 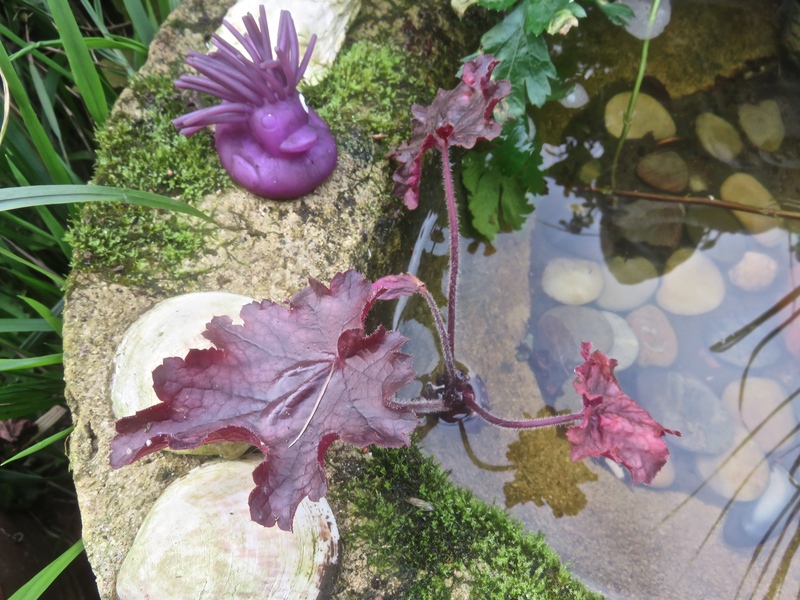 Our eagle-eyed head gardener spotted the wilting plants yesterday afternoon, lifted what was left of them, scraped off the infestation, and placed them in water to encourage new growth. The rubber duck is keeping its eye on them. She continued the task this morning. 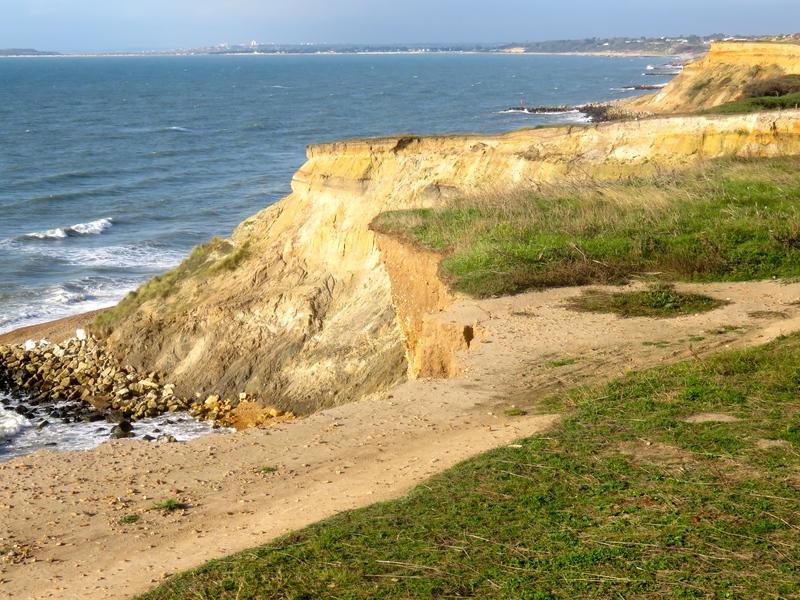 Not being tempted to repeat yesterday’s trek, I took my normal walk to Hordle Cliff top and back. 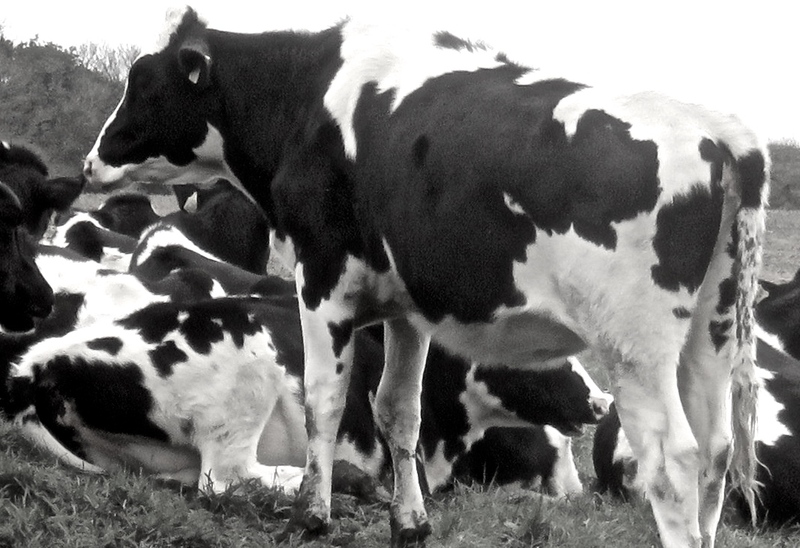 Friesan cattle occasionally amorous, clustered on the slopes at the bottom of Downton Lane, created fascinating random black and white patterns as they huddled together. When any one was subjected to an attempt at mounting she simply walked away, leaving her suitor with no alternative but to flop back in embarrassment onto all fours. 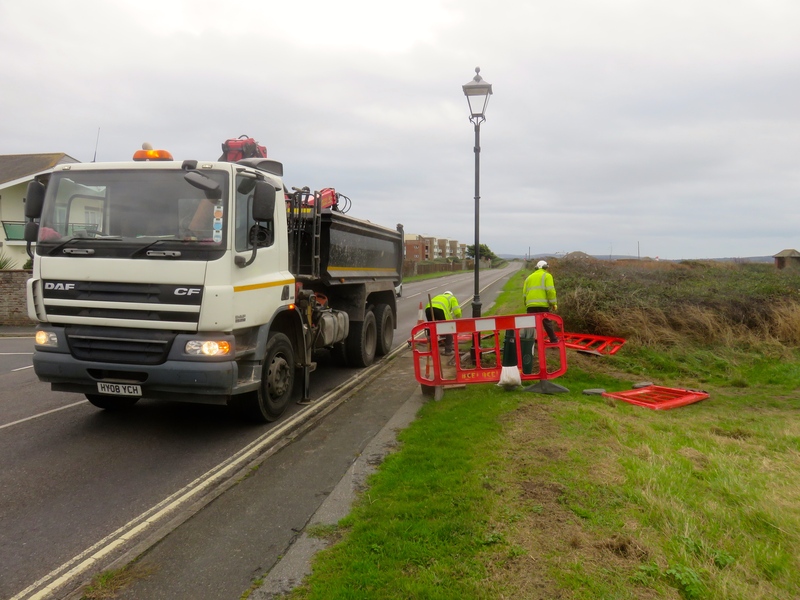 Along the coast road, a tidy up crew were clearing away the barriers and filling in the holes left during the replacement of the street lighting. 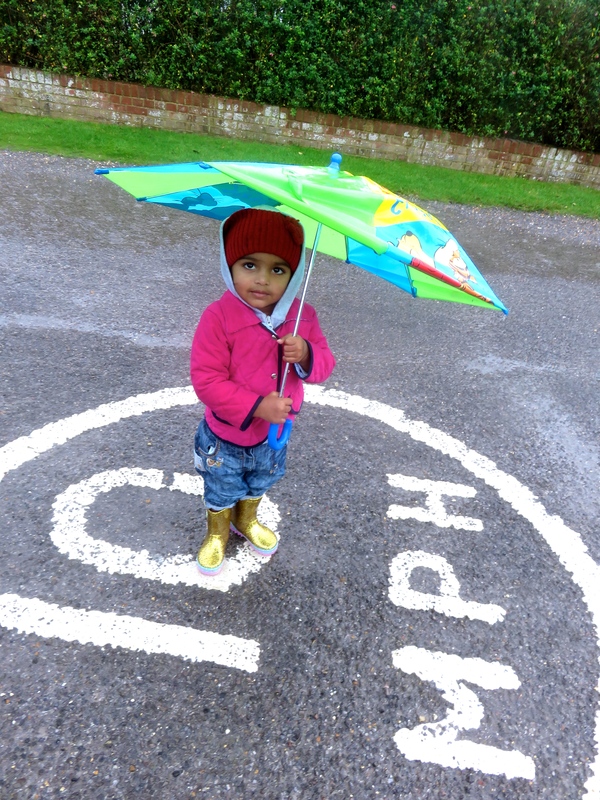 Interestingly, there is no street lighting on our stretch of Christchurch Road, with its 60 mph speed limit, approaching a crossroads, although there are three or four lamps on Downton Lane, each one placed on a bend. 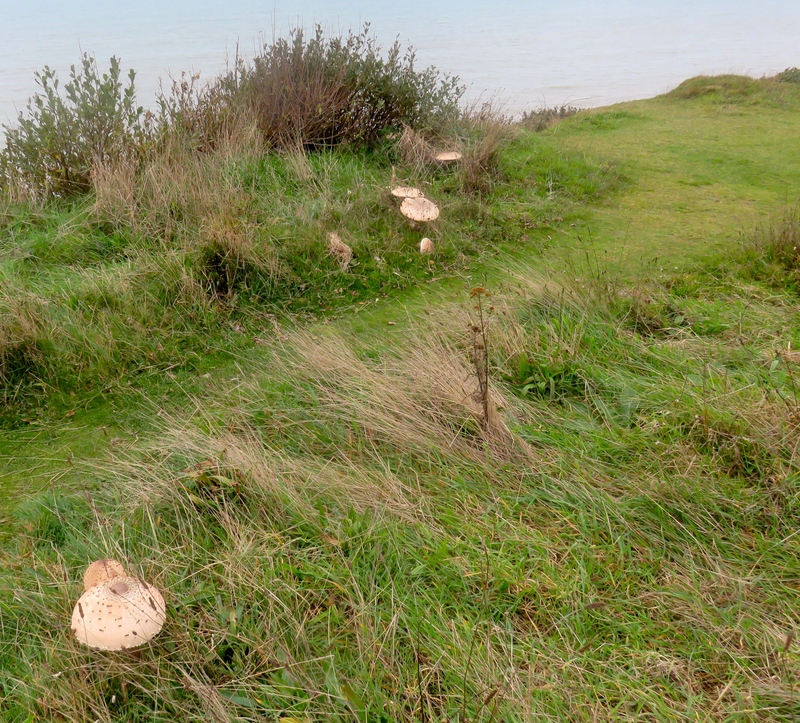 Possibly flourishing in the sea air, the mushroom crop, producing its own intriguing symmetrical patterns, increases daily. On an early morning shopping trip, Jackie had noticed Lidl were selling oil filled radiators. You never know when you might need one, and with this store’s surprises you have to be quick to catch them before they disappear, so we went back this afternoon and bought one. Afterwards we put in a good stint on the back drive. Jackie continued the creation of her lengthy flowerbed on one side, and I dug up more bramble and ivy roots. A mixed grill to rival that of The Plough at Tiptoe was produced by Jackie for our evening meal. With the addition of peppers and onions hers was rather less dry than that of the pub. She included neither beef steak nor lamb chop, but the large gammon steak made up for that. I could just about manage to eat a tiramisu afterwards. Jackie drank Hoegaarden, and I finished the Lion’s Gate wine. One of the attractions for me of The Crown Inn at Everton is that chips and gravy comes as standard with their steak and kidney pudding. It is otherwise infra dig to pour gravy over chips. Chips must be dry, and it is mash that must be dowsed in gravy. Having witnessed me betraying my penchant for this culinary crime at The Crown, Jackie provided gravy for my meal tonight. She didn’t think it really appropriate for a fried egg, and therefore didn’t partake, but for me it was perfection.